After reading a series of articles about turn of the century hardscrabble living in rural North Carolina, I saw details of a primitive lock these country people typically used, made entirely by hand. My NC grandparents, who I visited as a child, had locks like this on the shed and barn, but I had forgotten all about them. Thus inspired by the stories I’ve recently read, I thought I’d try to construct one. This is a prototype, and I will start another one with refinements, resizing, and changes to the key so that it cannot easily be defeated. 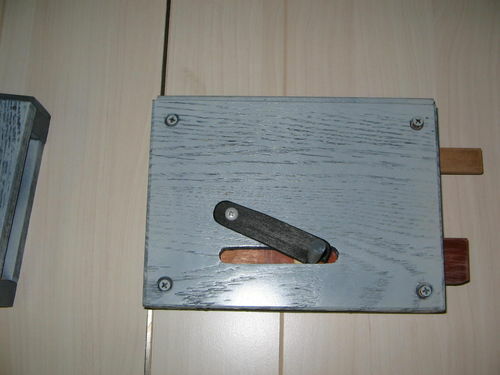 This is the original mock-up, showing the old concept of having a series of pins that engaged the sliding bolt. 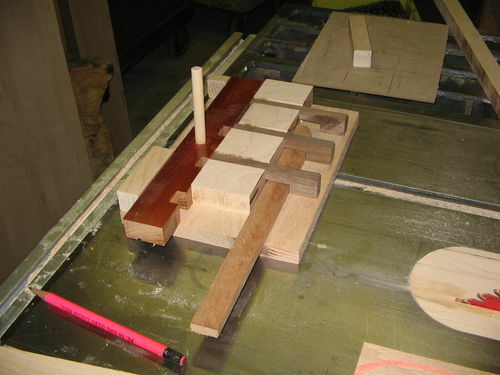 The key, essentially a piece of 1/4” X 1” cherry, would be inserted into the lock body and lift the pins so that the bolt could slide out of the mortise and into the jamb. The pins reliably fall into the bolt notches by gravity alone. The bolt itself is spring-loaded, tensioned to automatically engage the bolt into the mortise. A drop-down catch keeps the bolt disengaged. Here is another view, showing the key and mortise/receiver. With a taper on the key, smooth and waxed, it easily slides through the notches in the pins and lifts them. The whole action is quite smooth, and I’ve relieved the dadoes around all pin ‘barrels’ and bolt ways, due to potential movement when it’s damp. It was good to use up some little bits of scraps, oak, maple, cherry, and even some rescued solid-wood flooring of god-knows-what species. Just like our Appalachian forbearers would have done. A couple more images. When this assembly finds it’s location, I’ll replace the short screws with through-bolts with nuts and lockwashers on the other side. 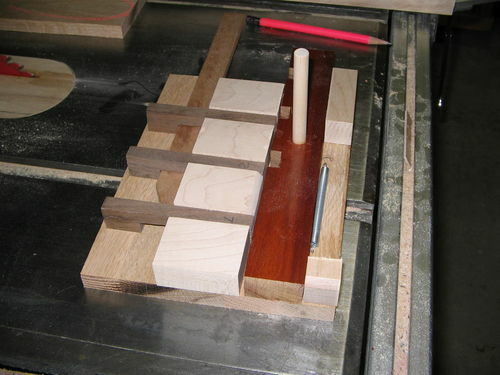 I don’t know of any recent LJ project postings of handmade wooden locks. Hope you like it!! Thanks, Skylark, for your kind words. Are you ever in the rural back county of Tennessee? There are still quite a few of these in use around your neck of the woods, as I understand it. 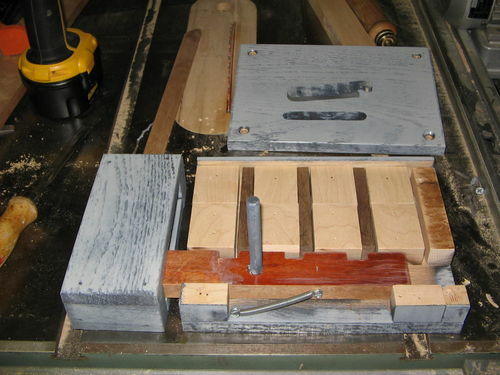 @DonW: I’m proud to say that, except for a bit of bandsawing, every surface of each component was handplaned, scraped, or otherwise hand-tooled. This was a gratifying project, what with the primarily hand tool produced result. I would have set it on the roof and let it achieve a nice gray patina, but that would take five years so I simply put some Cape Cod gray over stove black paint for a quickie aged look. I must be an idiot because I don’t understand how this works. Wow. That is great! Thank for share. Need one! Thanks again for the great comments, guys!! danoaz: Maybe I made it sound over-complicated. Basically, the bolt slides to the left to engage the jamb. When you insert the key, it lifts those three dark wood pins out of the notches in the bolt so you can retract it and unlock the door. thank You for favoriting, Mark! 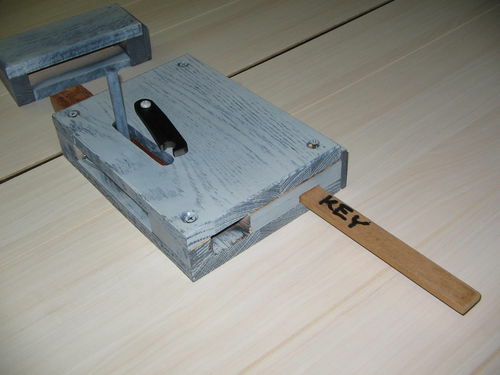 I hope to see some other hand-made locks turn up on Lumberjocks. It’s a simple weekend project when the weather is bad outside. I’d be flattered to see others built and better yet, installed on your shed, chicken coop or potting barn! I love it! I never seen one of these before, very interested to see where you go with this! Thank you for sharing it.